If you are a Contractor or a Homeowner and you just want to pour concrete at your own pace, or you just want to avoid the headaches of standby fees and hiring a pump operator, or you just have a small job that needs to get done quick, Our Carts are exactly what you need. 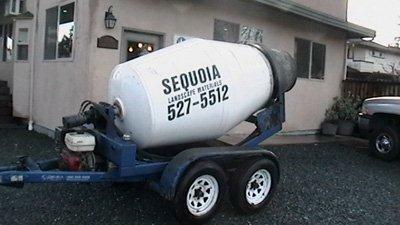 Our concrete carts hold one yard (1 yd) of concrete. We use a ¾-inch aggregate for our concrete and can certainly make specialty mixes. Please call our office for pricing and trailer availability. Save some time and download our Rental Agreement (click here to view or download). Full size truck ½-ton or better, with a receiver unit/tow package. Your vehicle must meet the requirements to pull a tow weight of 7000 pounds (lbs). Please check your vehicle’s owner manual for weight limits. You must show proof of a valid California driver’s license. You must also provide proof of insurance. Deposits are required for the following: concrete cover, receiver. All carts are to be returned clean, within 2 hours and before closing. Unsure how much you need?